New opportunities are springing up in Evington for everybody that would like to have a go at gardening in a friendly atmosphere. Complete beginners and those with some experience of all ages are welcome to join us at Graceworks, a sustainable community landscape project in the heart of Evington. 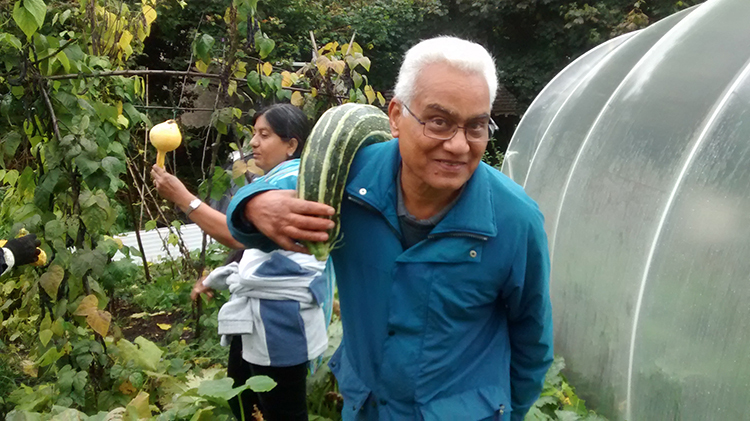 Based at the Wycliffe URC on The Common, the project has received support from Awards for All and through our involvement with the Leicester Food Plan we are able to provide free learn to garden sessions every Wednesday from 10-30am to 1.30pm. In the Autumn sessions, which run up to and including October 7th, we will be discovering new skills such as how to make great compost and set up new growing areas, how to grow food, herbs and flowers outdoors, in small spaces, in a poly-tunnel or even in window boxes and sharing tips over a nice cup of tea. So far, we have successfully built our own wormery compost bin by upcycling old tyres and over the coming weeks we plan to establish raised beds and create a Winter planting plan for our two polytunnels. Graceworks will also be offering a series of one off training days where participants can help us to develop the site, including creation of an outdoor eating area with a barrel oven and the planting of an edible forest garden. Our Aquaponics system is also under development and we have three active beehives for those who would like to learn more about urban food production. All ages and abilities welcome….bring lunch or food to share. Drinks provided. All tools and equipment will be provided but please wear boots and suitable outdoor clothing. Bring gardening gloves if you have them.